Check out our infographic on why it is important to explore careers in early years! The roots of career development begin early in a child’s life. Through play, young children explore their environment, learn to problem solve, make decisions and adjust to change. From a young age, children envision themselves in possible roles for their future. They talk about and try on their hopes and dreams. During these formative years, young children are influenced by family, school and media – and need to be supported in their career development. 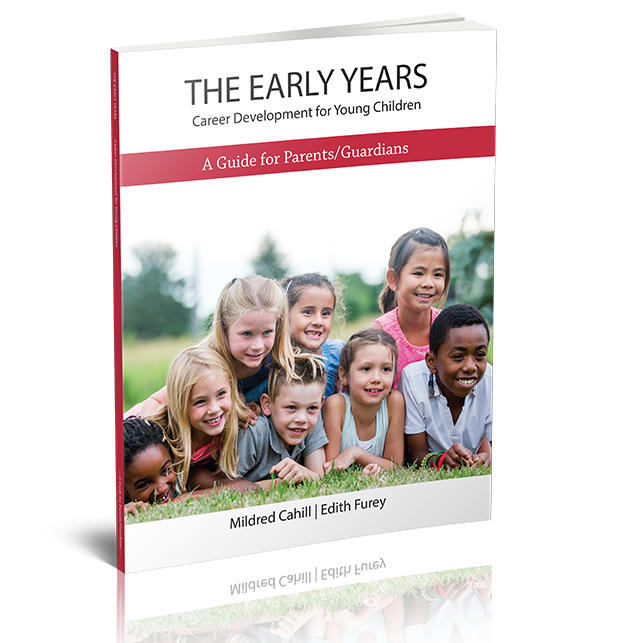 Based on research conducted by Memorial University’s Dr Mildred Cahill and Dr Edith Furey, this guide explores the influence that parents and guardians have on the career development process of children, aged 3 to 8. It empowers parents to support young children during this critical period of play, fun and fantasy. The guide provides practical advice and actions that parents can take to help children develop positive beliefs about themselves, and enable them to imagine and achieve their aspirations. A Guide for Educators is also available. Dr Mildred Cahill is a Professor, Counselling Psychology, Faculty of Education, Memorial University of Newfoundland. She is a researcher (career development, diversity, multiple technologies and counselling) and educator involved in collaborative program development work locally, nationally and internationally. Her research includes the design, implementation and evaluation of counselling programs in career and diversity counselling for children, youth and adults. Dr Edith Furey is Associate Professor in Special Education, Faculty of Education, Memorial University. She is an experienced special educator and administrator in K-to-12 education. Her research interests include: special education, transitional planning and educational programming. The Early Years Children’s Guides are situated in important research on the career development needs of children. Number 1, parents are the most influential sources of career information for kids. Empowering parents with the knowledge of how to positively influence their children’s career development is critical. Meanwhile, the earlier we start to guide children into knowing who they are, what is important to them, and to learning about different careers, the more we can create the career readiness for them to make the best career choices. This is a developmental learning skill that needs to be taught from kindergarten throughout all grades to become effective. These resources provide great ideas for doing this. Educators and parents hold the keys to introducing children to the vast array of careers in the community. Their encouragement of exploring, experiencing‎ and dreaming about the child’s future self is integral to opening the doors to career choice. The ‘Vignettes,’ ‘Something to Think About’ and ‘What If’’ sections of the guides are insightful for both parents and educators. The Early Years Guides support the YMCA’s Playing to Learn evidence-based curriculum that introduces young children to new ideas and strengthens their knowledge about the world around them, as well as the YMCA: A Place to Connect after school program that focuses on children’s strengths, their desire to take on new roles, and explore new ideas. We believe that the foundations set out in these guides – choice, play, discovery, positive relationships – are necessary elements as children learn about work, careers and possibilities.